I am curious if there exists a travel planning tool which can help organize a trip around concerts of the major European symphonies. As an example, let's say I really want to see the Berlin Philharmonic play one of my favorite works. How could I figure out which weekend(s) I should plan on going to Berlin? Or maybe I just care about a particular piece, and want to see who is playing it in the near future. What hall are they playing in? How much (roughly) are tickets? 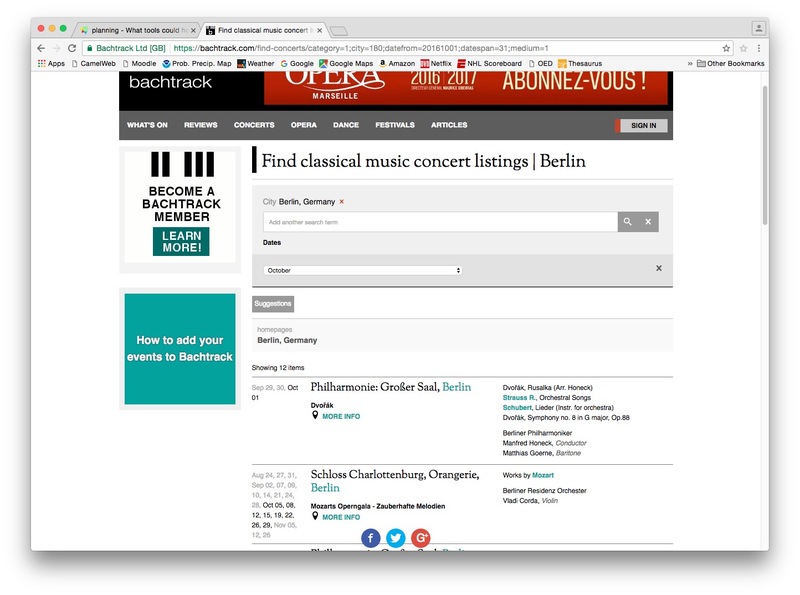 With the exception of ticket prices, BachTrack does most of what you want. One can search by city, by hall, by orchestra, by composer, or by work (or any combination thereof), and find performances for the next year. The listings aren't complete—it focuses on major orchestras in major cities—but that's probably what you would be interested in for travel purposes. Not the answer you're looking for? Browse other questions tagged planning events music travel-tools or ask your own question.